Manufacturer of Water Pouch Packing Machine. Our product range also comprises of Filling Machine, Laboratory Incubator and Water Plant. 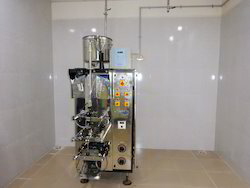 Our competency lies in offering our clients an excellent quality range of Water Pouch Packing Machine that is ideal for packing water pouches efficiently. Our skilful professionals only use quality tested components that are procured from the reliable vendors of the market and contemporary technology. We assure our clients that this machine is quality tested against predefined quality parameters, in order to meet industry set standards.